Command Sgt. Maj. Ronald Bly, senior enlisted adviser for 3rd Brigade Combat Team, 10th Mountain Division (LI), places the 36th Infantry Division patch on a battalion command sergeant major during a ceremony Friday at Fort Polk, La. The 3rd Brigade Combat Team is the first active-duty brigade to wear a National Guard unit's patch and is currently the only active Army unit wearing a National Guard patch. FORT POLK, La. – The 3rd Brigade Combat Team, 10th Mountain Division (LI) "Patriots" have taken on a new challenge in the effort to elevate U.S. Army readiness. The brigade is now partnered with 36th Infantry Division, Texas Army National Guard, through the Associated Units program. "The Associated Units pilot allows us to leverage the capabilities and capacities of the active component, Army Reserve and the Army National Guard as One Army,” Gen. Mark A. Milley, Army chief of staff, said of the Total Force effort. The three-year pilot program pairs units from all U.S. Army components for training oversight. The goal is to build relationships, share knowledge and have a fully adaptable and ready force before mobilization. Maj. Gen. Lester Simpson, 36th Infantry Division commanding general, said that although this is the Patriot Brigade’s first time wearing the 36th ID patch, this is not the first time the two units have worked together. “I am excited about this next chapter in the Army’s Total Force policy that goes far beyond just wearing a patch,” Simpson said. “We will train together, we will fight together, and this will not be the first time. 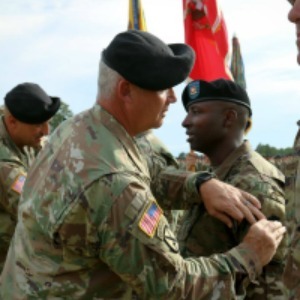 Col. Brian Sullivan, commander of 3rd Brigade Combat Team, 10th Mountain Division (LI), stressed to the Soldiers the positive changes this partnership brings. “Our Patriot Soldiers will gain the experience, insight and professionalism that a National Guard unit can bring to the fight,” Sullivan said. “By giving 3rd Brigade Soldiers access to National Guard facilities and giving the 36th Infantry Division Soldiers access to our facilities, this will be a mutually beneficial arrangement for all units involved. “In an era of reduced resources, we must train, deploy and fight as one team,” he added. Sullivan also spoke about the storied history of the 36th Infantry Division, when Staff Sgt. Homer Wise, from Baton Rouge, La., was presented the Medal of Honor for his actions during World War II. After speaking about how Wise saved his fellow Soldiers lives and suppressed and killed the enemy fire, Sullivan made a connection with the troops on the field before him.